Formed in 1952 by Les Matthews and a group of fellow enthusiasts to rescue what they could from sites being destroyed by chalk quarrying and building, and still going strong today. The Society takes its name from the Anglo Saxon administrative district or “Hundred” of Bedfordshire in which Dunstable and the surrounding area lies. The Society is indeed fortunate to have its own headquarters at 5 Winfield Street in Dunstable, a building that was a pub known as “The Sportsman” in Victorian times. Most Sunday mornings except during the winter we try to get out on site to do Fieldwork, all of which is carried out with the prior permission of the landowner. Initially we would walk a field in a controlled manner to discover evidence of occupation e.g. potsherds, flint tools and metal, just about anything that is manmade. 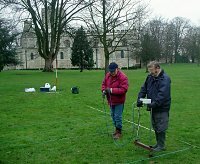 Secondly, if the site looks to be a likely prospect of former occupation we may then elect to carry out a geophysical survey using our own resistivity equipment. Assuming that this survey will give us an indication of a likely target, we will proceed to dig a trial test pit. From this point onward we are subject to sufficient resources and the landowner's tolerance. We are proud to be one of the few amateur societies who actively undertake our own excavations. All finds discovered during field walking or excavation are taken back to Winfield Street for cleaning, marking, identification and logging into our system, prior to an analytical report being made. Many of us are keen to take up project work such as pottery typing, skeletal study, ceramic building materials (brick and tile), model making, exhibitions and even fund raising. We currently have a long-term project recording the Victorian housing in Dunstable. We are happy to encourage and assist with any archaeological or historic project that you may wish to undertake with us. Can anyone join the Society? Age or lack of archaeological knowledge are absolutely no barrier to becoming a member. This is a hobby that you can pursue in your gardening clothes and little equipment beyond a small trowel - we have all the other tools required. There is no compulsion to come along to every session; this hobby can fit in with your lifestyle. We publish a members’ newsletter up to three times a year and a more formal Journal once a year to publish our work and conclusions. We have a series of interesting talks throughout the winter period generally on an archaeological or historical topic. We also hold workshops on various aspects of archaeology for which society members have priority booking. In addition we have a growing member’s library covering most aspects of archaeology, and a separate one of history both local and worldwide. There is also a social side of meals, outings and the occasional excursion to places of interest. We also have Society publications for sale and a meeting room (with disabled access) with kitchen and toilet available for hire.